Let’s get right down to it. I adore this salad for many reasons, one of them being that you can actually just omit the lettuce (umm I didn’t just say that 🙅) and toss the roasted sweet potatoes, corn, black beans, and avocado dressing together for more of a Southwestern Salad meets *Chips and Dip for Lunch* situation. 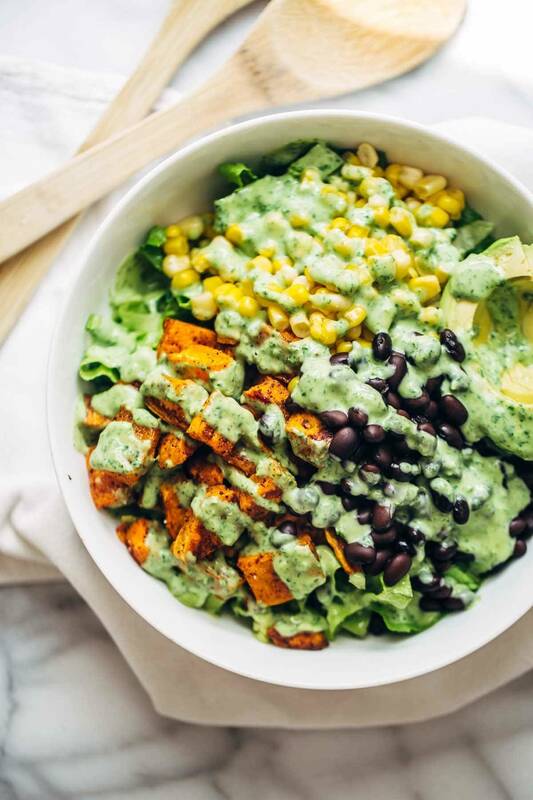 This healthy Spicy Southwestern Salad recipe has roasted sweet potatoes, black beans, corn, lettuce, and creamy avocado dressing! Preheat the oven to 400 degrees. Peel the sweet potatoes and chop into bite-sized pieces. Mix the olive oil, cumin, and chili powder together in a small bowl. Brush mixture on sweet potatoes. Roast for 10 minutes. Stir or shake the pan. Turn heat up to 425, and roast for another 10-15 minutes. Check, stir, and bake until the sweet potatoes are just barely roasty-brown on the outside. Season with salt and pepper. 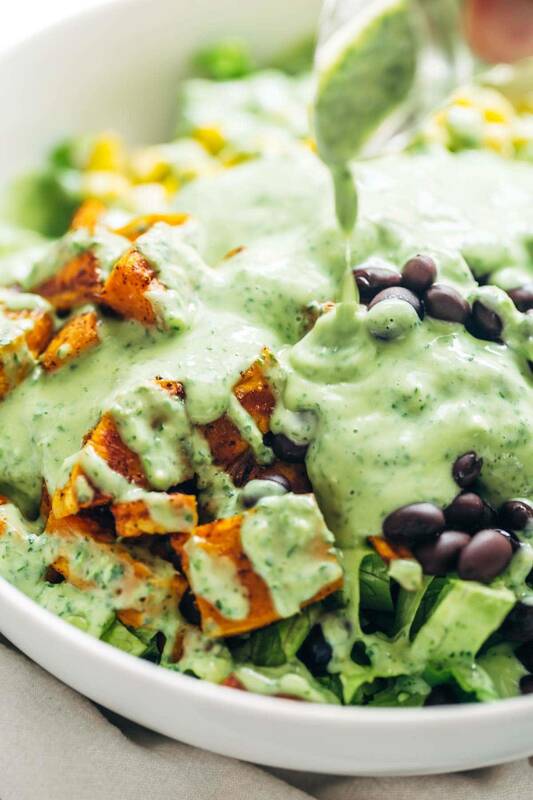 Toss the beans, corn, lettuce, and sweet potatoes with the dressing. Serve with chips and/or the other half of the avocado for extra yum! 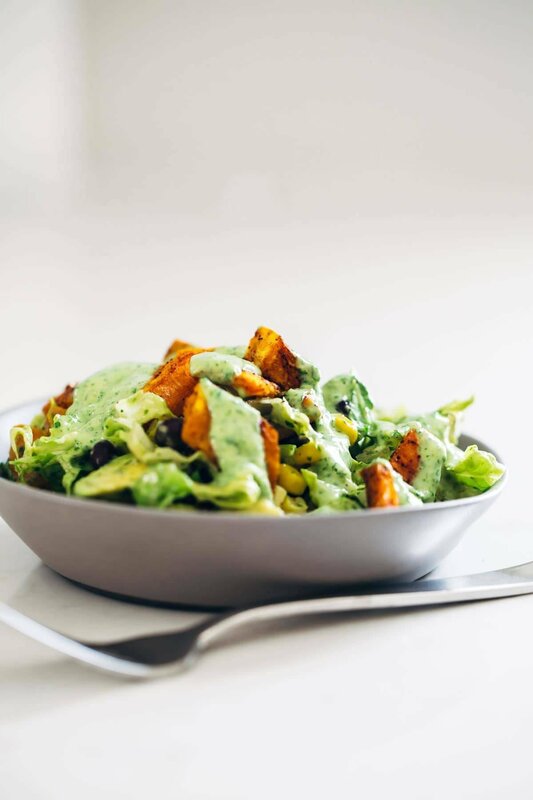 This recipe can be made vegan by swapping the Greek yogurt with a non-dairy yogurt alternative – even just a little hunk of tofu would work, or maybe the whole avocado instead of half. But don’t use oil – the oil and avocado don’t really blend together well (I speak from experience). HERE ARE THE SPICY CHIPS. They are really spicy and really good. This is an affiliate link to order a box of them on Amazon. This looks like the perfect southwestern salad! This is the best look salad, bar none! I love your presentation. So swirly and whirly. Confession, I always (like everyday) hit up the Southwest salad at McDonalds. (That’s when I’m not at Chipotle which is rare too.) I NEED to make this and impress all my friends! This is just too perfect! I seriously think I could eat this EVERY night! Oh my goodness – this looks perfect. 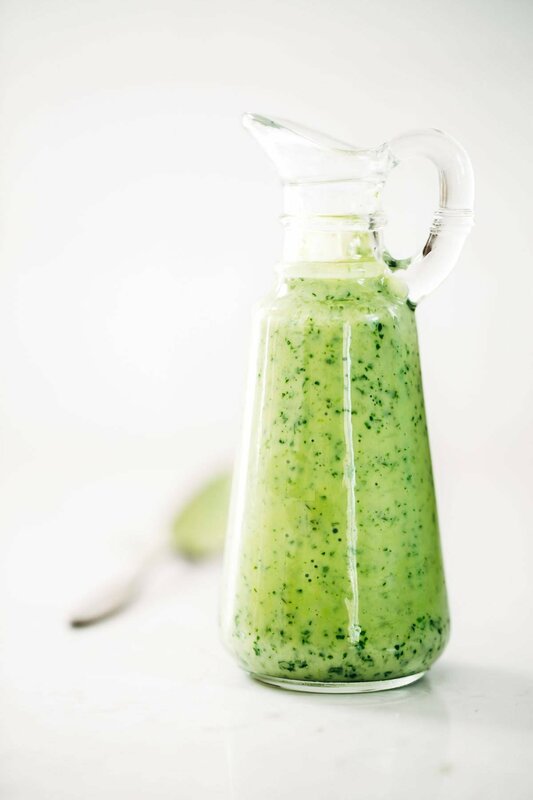 That avocado dressing though. I can’t wait to get this in my mouth! Avocado lovers unite!!! Love this salad and loooove that dressing. Totally crushing on this right now. This looks amazing. My family doesn’t like cilantro. Think it would be good with parsley?? Lmk what a good substitute to cilantro would be! Thanks! Oh goodness, this salad looks awesome. Must. Make. Soon! Your last post – so inspiring and beautifully written. This salad – so inspiring and is going to look beautiful when I make it and then put my face in the bowl because I won’t be able to eat it fast enough. YUM. My kind of salad! 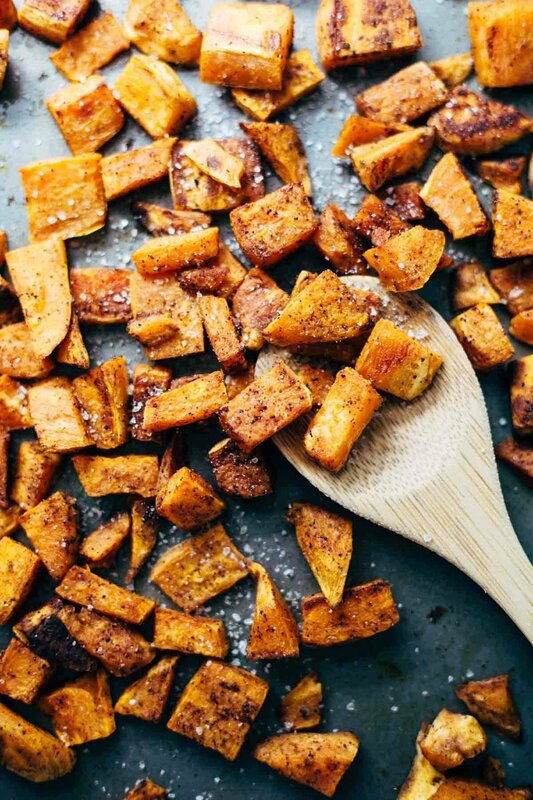 And I don’t think my roasted sweet potatoes have ever looked that delicious! Aaaanndd this is what’s for dinner tonight, thanks Lindsay! Thank you for the lovely salad recipe. It sounds so good and refreshing. This looks soooo delicious. Love the little bite size sweet potatoes! Yep – this will be dinner tonight – I’ll use shrimp in place of the sweet potato (’cause that’s what I already have) and call it good. It’s like my whole life is a quest for more chips. aghhh! Lindsay, this looks amazing!! My step-daughter and I are obsessed with anything avocado! I think that this will be perfect for our family picnic! I don’t have sweet potatoes, but I have butternut squash. Do you think that the salad will still be as delicious? I’ve been following your blog recently and I must say you make my mouth water! 😉 I’m new to the blogging world. Your blog is a great inspiration! Thank you! I do! I love squash! This looks amazing! umm totally craving this now:) I need an avocado and sweet potato to make this. Totally on my to do list! Oh my goodness. Saw this and had to run out and get some sweet potatoes. I have all the other ingredients. I don’t like cilantro, so I substituted with Italian parsley. This was a big hit with me and my husband. Hubby likes side salads, but wants meat . . . with this salad he didn’t need the meat or want the meat. A delicious and fabulous salad. Thank you Lindsay! Nice! I’m so glad to hear that Lynn! This sounds absolutely amazing! I can’t wait to try it! Thanks for sharing!! Oh yum!! All the best flavors in life, all together, where they’re meant to be!! 🙂 Can’t wait to devour a giant bowl of this! This recipe looks amazing! I’m also wondering where you got the dressing container? Not sure if that is the right term, but it looks lovely as well, and I’m looking for one. Please share when you get a chance! Thanks Leslie! Umm, sadly… it’s just from a thrift store! 🙂 Paid like 50 cents for it or something. Definitely pinning for my weekly meal planning. This salad has everything I love in one bowl!! !